Dogs: We offer a new grooming service for dogs in our a new bathing and grooming area. 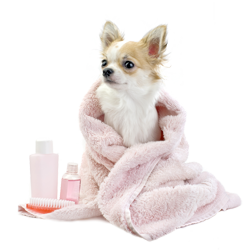 Dogs are shampooed with our deliciously scented honey and oatmeal shampoo followed by a trim if needed, clip nails and ear cleaning. Finally all dogs are blow dried leaving them beautifully fresh and clean. Cats: We are able to wash and brush cats but all de-matting needs to be done under sedation for their comfort.